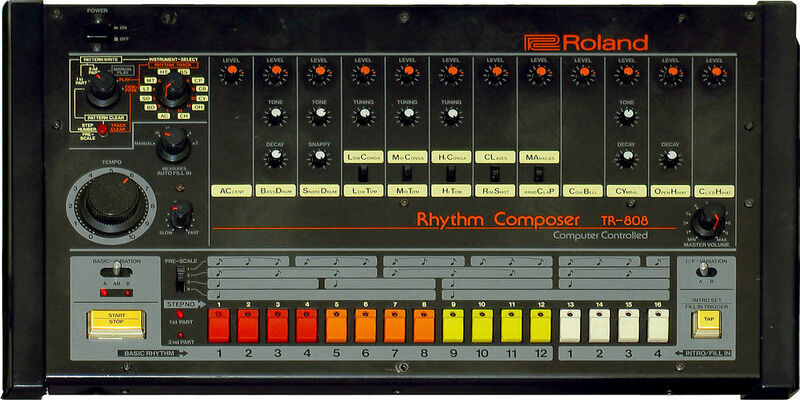 Until the 808 became available in 1980, drum machines were something you put on top of a living-room organ to play along in time with. Even if you don't already know the 808 by name, you will know its sound. It's a timeless icon that has touched almost every genre of music imaginable with a sound that is as relevant today as it ever was. While Roland’s box was reasonably priced (a modest $1,195 to the LM-1’s spendy $4,495), the machine was discontinued in 1983 thanks to poor sales and a reputation for sounding weird. It took the machine’s supposed uselessness to give it a new lease of life. By the time it was discontinued the unloved Roland Rhythm Composer was a regular fixture in junk shops and pawn shops, and was easy to pick up for under $100. In the 808, 80s producers saw a cheap – and relatively intuitive – means of generating beats, and more specifically, a bass drum that could easily fill out the lower end of a mix – as well as tight hats, crispy claps, snappy snares and an unmistakably honky cowbell. The rest is history. The world of pop also embraced the tightly sequenced sound of the 808. Compared to all other drum machines on the market, it can be heard on more frequently played records. A short list of famous musicians that relied on the machine to create iconic tracks and albums include Marvin Gaye, Beastie Boys, Beyonce, Diplo, Lil Jon, Prince, Dr. Dre, Outkast and Bassnecter. In fact, Marvin Gaye’s ’82 hit “Sexual Healing” is often cited as the track that took the 808 mainstream. 4. Do I make your heart beat like an 808 drum? The familiar thud of the 808 kick has become an alarmingly common metaphor for the heartbeat, popping up in Billboard-cracking songs from Rihanna (“You hear that 808, the drum/That’s my heartbeat, I’m going numb” from ‘Emergency Room’), Ke$ha (“Do I make your heart beat like an 808 drum” from ‘Your Love is my Drug’), Britney Spears (“you got my heart beating like an 808” from ‘Break the Ice’) and even Macklemore and Ryan Lewis (“Go hard like I got an 808 in my heartbeat” from ‘Can’t Hold Us’). On August 8, 2015 (8/08/15), Roland held a celebration in honor of their famous drum machine’s anniversary. Music began at 8:08 PM and had performances by David J. And the Gentleman Thieves, Bon Harris, Brian Liesegang and Kerry Brown.